Lot 595. Ti. Quinctius or Quinctilius. 112-111 B.C. 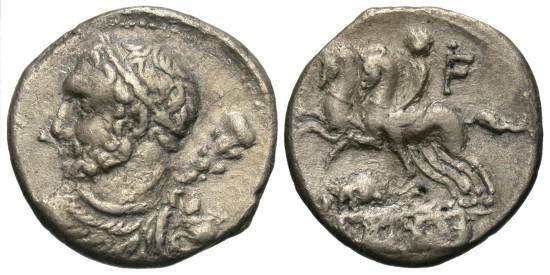 AR denarius (18 mm, 3.74 g, 9 h). Rome. Laureate bust of Hercules left, seen from behind, wearing lionskin and holding club / TI-Q, Desultor on horseback left, leading second horse; above, F; below, rat; in exergue, D·S·S·. Crawford 297/1a; Sydenham 563; RSC 6. Minor roughness on reverse. Very fine.